TidySurveys helps museums, zoos and aquariums to gather satisfaction feedback and audience research, online and offline. With our unique, easy-to-use survey system, it’s easy to conduct visitor feedback surveys and museum visitor surveys and learn what your visitors are thinking and how they experienced your exhibits and services. There are no boring paper questionnaires or comment cards to fill out and no paper surveys to mail. A simple, mobile-friendly survey can be accessed via SMS Text Message, QR Code, or vanity URL link, and your visitor’s feedback is captured, compiled into intuitive, yet powerful, analytics and reports, which are ready to use. Your visitors are on their way in no time. 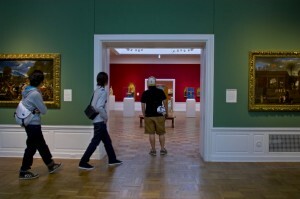 Anytime you need it, you can conduct mobile-friendly museum visitor surveys. Conduct interactive surveys, quizzes and assessments across all devices with the most mobile-friendly museum visitor surveys tool – TidySurveys! Reap the benefits of streamlined, automated processes and reduce workload and costs. Fast and easy survey creation! With TidySurveys, there’s no programming or statistics knowledge required. Realtime reports greatly help to free staff from workload, and make reviewing feedback a cinch. Gain insights into why visitors came to your facility, whether it be for the full experience, or a specific exhibit, or whatever else. Convert visitors to regulars, or even members or donors, by engaging them and soliciting their feedback, while building upon your Listserv. Let visitors know you care by giving them a voice and a vehicle to share it with you. Plus, there’s opportunity to incentivize the feedback while securing repeat visits. Create multiple museum visitor surveys, whether you want to capture general feedback or focus on location-specific or exhibit-specific feedback. With TidySurveys, it’s unlimited. As an interactive information and visitor feedback solution, TidySurveys makes it easy to “info-tain” and “edu-tain” your visitors in a convenient and engaging way! Sign up today!